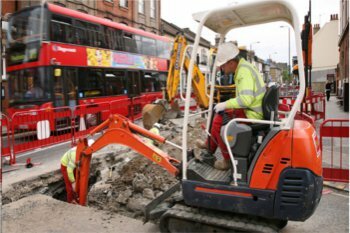 The Department for Transport (DfT) has announced plans to allow the roll-out of lane rental schemes across the country, giving local authorities the option to charge utility companies up to £2,500 a day for digging up the busiest roads at peak times. The news follows successful trials of lane rental schemes by Transport for London and Kent County Council, and a consultation on different options for managing road works last year. The Government’s response to the consultation states that new lane rental schemes will need to be approved by the transport secretary in line with existing primary legislation and approval will come with conditions attached. Authorities would need to have a well-run permit scheme, for example, permit fees were proportionate, discounts were offered for joint works, compliance with permitting regulations and guidance, schemes fully supported the delivery of national infrastructure projects like HS2 and broadband/full fibre roll-out. Schemes would apply to a local authority’s own works in the same way as in Kent and London. Lane rental charges should be used to incentivise work outside of peak times, they are waived for joint works, caps are put in place for major works to install and to replace apparatus so that these works are not unfairly penalised and delayed. Schemes are trialled for a period of time before ‘going live’ and reviewed annually to ensure charges remained proportionate and are applied to the most congested roads. We proposed in the consultation that lane rental should apply to around 5% of the network, as is the case in Kent. Responding to the consultation, Jerry McConkey, joint chair of HAUC(UK) – which brings highways authorities, utility companies and government together – and CEO of JAG UK, representing authorities, told Transport Network that the ‘super permit’ option (or option three in the consultation), which would combine aspects of the current permit scheme system with lane rental schemes was JAG’s preferred option. This option was favoured ‘as it gives consistency and transparency’. However he added that the review of lane rental ‘has demonstrated that this does bring benefits particularly to public users of the highway’. ‘JAG UK looks forward to working with the Department for Transport to see if we can change behaviours in key areas of the country. Permit schemes are a step forward for behaviour and lane rental can be a further step forward for the economy,’ he told Highways. Lane rental roll-out was a popular option in the consultation, with 66 votes of support out of 145 responses – almost double the level of support of any other option. In response to the consultation, a stakeholder group representing utility companies estimated that implementation of lane rental across England and Wales could increase annual costs of street works by £327m and suggested it would deter over £2.2bn of investment in infrastructure. The Government expects its lane rental roll-out plans to have a net £84.3m benefit to business. DfT officials said that ‘about 2.5 million roadworks are carried out each year, costing the economy £4bn in increased costs to businesses through late employees or deliveries’. In London, utility companies have worked together more than 600 times since lane rental was introduced in 2015, up from just 100 beforehand. Cllr Judith Blake, the Local Government Association’s transport spokesperson, said: ‘The pilots in both Kent and London have proven that giving councils greater powers to regulate roadworks can deliver huge benefits to businesses and road users. It typically takes an authority around 12 months or so to develop, consult and implement a lane rental scheme.